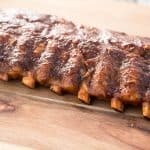 The easiest pressure cooker ribs - perfectly tender with an amazing rub. In a small bowl - combine spices together, making sure to break up the brown sugar (with a fork or whisk). The actual measurements are a "secret" from a friend, but just think of t this way... Use more of the spices listed at the top and less as you go down the list. Then season ribs liberally on both sides with spice mix. Add 1 cup of water and a trivet into the pressure cooker. Place the ribs on top of the trivet. Lock lid, close vent, and set manual timer for 20 minutes. Then allow pressure to naturally release. Transfer ribs to a baking tray and brush sauce all over the ribs on both sides. Switch the oven to low broil. Place ribs in the oven on bottom rack for 7 minutes each side. I recommend doing bone-side-up first.